The Bornean Treepie (Dendrocitta cinerascens) is a passerine bird belonging to the Dendrocitta genus of treepies in the crow family, Corvidae. It is endemic to the island of Borneo in South-east Asia. 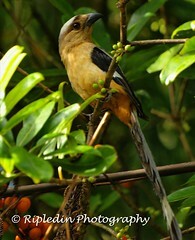 It is sometimes treated as a subspecies of the Sumatran Treepie (D. occipitalis). It is a fairly large bird, 40 centimetres in length, with a long graduated tail, broad rounded wings and short weak legs. The underparts are pinkish-brown. The head is also pinkish-brown with a pale silver crown and a dark stripe over the eye and across the forehead. The back is greyish and the rump is pale. The wings are black with a white patch and the tail is grey with black tips to the feathers. The bill and legs are grey-black and the eyes are reddish. The Sumatran Treepie differs in having a pale brown back, a dark brown head with a white nape and a thinner bill.